Solving the Maze was supposed to be the end. No more puzzles. No more variables. And no more running. Thomas was sure that escape meant he and the Gladers would get their lives back. But no one really knew what sort of life they were going back to. In the Maze, life was easy. They had food, and shelter, and safety . . . until Teresa triggered the end. In the world outside the Maze, however, the end was triggered long ago. Burned by sun flares and baked by a new, brutal climate, the earth is a wasteland. Government has disintegrated—and with it, order—and now Cranks, people covered in festering wounds and driven to murderous insanity by the infectious disease known as the Flare, roam the crumbling cities hunting for their next victim . . . and meal. The Gladers are far from finished with running. Instead of freedom, they find themselves faced with another trial. They must cross the Scorch, the most burned-out section of the world, and arrive at a safe haven in two weeks. And WICKED has made sure to adjust the variables and stack the odds against them. Thomas can only wonder—does he hold the secret of freedom somewhere in his mind? Or will he forever be at the mercy of WICKED? Upon starting The Scorch Trials by James Dashner, the second installment in The Maze Runner series, I fully admit that I was a little ambivalent about the book. The first one was sort of daring in a limited level, and it candidly wasn't a personal favorite of mine, but The Scorch Trials have managed to alter my opinion about the series. Possibly the entire series, but I may be going a little too far fetched with that thought, considering that I haven't read the third book yet. The first thing that I noticed right away is that the beginning chapters are already jam-packed with my most sought after starting action, laced with immediate mystery. Dashner's writing has significantly improved from The Maze Runner, with effective diction and sentence structure, and already exhilarating his audience with an expeditious fast-paced narration. One of the things that made me like The Scorch Trials is that it kind of has a The Walking Dead-esque appeal to it. If the Maze has Grievers, the unforgiving Scorch has Cranks--citizens that are highly affected with the sun virus the government are calling the Flare. They have grotesque and gruesome appearances, with their burnt skins, angry scabs and wounds, missing noses, and et cetera. The Cranks, at least the ones who are beyond gone from the Flare infection, are like the zombies that are constantly hungry for some human flesh. Another thing that made me like this book more than The Maze Runner is that the plot line is so riveting and very dynamic to the point that every chapter has an unforeseeable happening. The constant mystique that surrounds Thomas and Teresa and their true involvement with WICKED is even more bemusing and yet beguiling. The characters, whether old or new, are so twisted in their own different ways, I legitimately could not figure out anymore who are the ones with the halos and who are the ones with the horns and pointy tails. The element of uncertainty, one of the things that I like the most about books, is continually present from cover to cover and it, as I have mentioned in one of my previous reviews, will truly challenge your moral judgement. Because just like the characters in the book, your loyalty to your friends (or in your case, your favorite character/s) will be tested as well. However, despite all the great things that I adore about the second book in the series, the lone thing that did not appeal to me is Brenda's character. Frankly speaking, I felt uncertain whether she's someone incorruptible or not, and my mind's been debating about that circa the chapter she was first introduced as Jorge's right hand. She's a little "shady" for me, so to say. I feel like I don't have a clear knowledge of who she is as an individual. She has no background for me, just someone who has a "too forward" kind of personality. I had a hard time connecting to her. As far as recommending the book, The Scorch Trials is a good novel to pick up if you are looking for an intense and suspenseful action-packed read. Nevertheless, wryly speaking, it is definitely not the perfect book to pick up during the summer because . . . Well, it's summertime, temperatures are reaching the hundreds; I'm pretty sure you don't want to read a book that is set in a terribly burnt up placed called the Scorch. Trust me, I learned the hard way. You'll be "scorching"(wink, wink) along with the book. I can honestly say that the Scorch Trials kind of pissed me off. Not the book. The ACTUAL Scorch Trials IN the book. I don't think I understand the concept behind it yet. I just finished The Death Cure and STILL don't get why they had to experience those variables. But, any who.. I loved this book. It was a great continuation to the series. I would love to say that I learned a lot more about the main characters in this installment, but I really didn't. The only character that you are more introduced to is Teresa and let me say that I loved hating her in this book. In The Maze Runner, I wanted her to be like a heroine of some sort, but she just didn't reach those expectations, which in my opinion paid off in the book. After reading this, I seriously came to hate her. I mean, what good is she, you know? Ughh. End Teresa rant. I waited to write this review until after I finished reading the final installment of this series because I thought I would have more insight. Well, I don't. I rank this as the worst book in The Maze Runner series and it STILL receives 4 stars from me. It was a great read, it was. The only reason I didn't give it 5 stars is the fact that Teresa is the most horrible character in the history of dystopian characters and that the variables that they had to encounter were pointless. Absolutely pointless, if you ask me atleast. I'm pretty sure I have nothing bad to see about The Scorch Trials. There was so much action I wasn't bored for one minute. I found myself being torn between wanting to relish the story and wanting to flip pages as fast as I could. There was just the right amount of mystery that I continued wanting to discover the answers instead of becoming fed up with all the unanswered questions. And boy, are there questions. It starts with a few and then they just snowball from there, but luckily, answers are slowly given along the way. It leads quite nicely into the last book. All the unexpected twists and turns were perfect. My mind kept being blown over and over. It was awesome. There was a tinge of horror to this one even more than the first, but it's a raw, real horror instead of paranormal or anything of the like. It was such a surprising aspect that only made me love it more. Each new horror just made me sympathize with Thomas and his friends moreso. The writing is also very well done. I think the third-person POV makes it even more realistic and easier to feel what Thomas is going through. I think I went through the gauntlet of emotions just as much as him. Everything felt so realistic, I was turning around checking to make sure nasty monsters sent by WICKED weren't right behind me. Especially Cranks. You'll have to read it, I definitely don't want to ruin the full effect for anyone. Final thoughts: This is a seriously fantastic follow-up book. I actually liked it better than The Maze Runner but only slightly. If you're in for a good action-filled book full of mystery with the added rarity of a main boy character definitely pick this up. I'm begging you, read these books! They're seriously amazing. As I start The Scorch Trials, all I can think is, why do they bother? I understand that when pushed, humans have a very strong survival instinct. But I feel like these kids have been pushed beyond the farthest limits you could set, and are still expected to keep going. With no trust in WICKED, and no security in the promise of a safe haven, why bother? At one point, Thomas does mention revenge against WICKED as his motive for pushing through his impending meltdown, but I just can't see revenge being worth it at this point. I guess that wouldn't make me a very good candidate! Anyways, its these thoughts that permeate my experience of The Scorch Trials. I had a hard time getting in to the story, as I felt how tired the Gladers were, especially Thomas, and it made me tired. Their acceptance of their inability to change anything made me feel hopeless and again wonder, why bother? For me, Dashner is unable to distinguish between creating suspense and just being plain annoying. I admit, I was on the edge of my seat for the majority of this book, as the twists were unpredictable. The problem I now face, is that I am left with next to no resolution. I waited in anticipation for almost 400 pages to find out that I have to read the next instalment to get any answers. Yes, bits and pieces were revealed, but nothing that really added to what I already knew from The Maze Runner. This does not sit well with me. I found myself having to put down the book and walk away because I was so frustrated with the lack of answers. And so many of the various plot twists introduced seemed needless and just added to my overall frustration, like Dashner was just making things up as he went. This gave the book an almost careless and unplanned feel, like a lot of the looses ends won't be explained because they weren't given much original thought. I'm sure in the next book I will finally get some type of resolution, but I feel like there should have been something given in this to make me WANT to pursue the next instalment. Instead, if I want to know anything, I HAVE to read The Death Cure. Seems like a pretty dirty and sneaky way to make sure I don't stop halfway through the trilogy. My next problem is that throughout the entire book, there is no sense of time passing...like, at all. When I got near the end, and the Gladers announced they had only 3 days to get to the safe haven, I was genuinely shocked. It was the first indication that any significant amount of time had passed (that I noticed) and the fact that almost two weeks had passed really surprised me. Part of me wondered how it took them so long to get to their destination, then I remembered they were supposed to be covering 100 miles. All the times they spent running kind of blurred together, and I kept catching myself wondering how long the Gladers had spent running, and how it was physically possible for them to run for such long periods of time. I probably missed sections of the plot contemplating how a person could run that often, on such little amounts of food/water in a desert-like landscape. Finally, continuing from The Maze Runner, I don't really care for any of the characters. I was glad to see Minho took more of a main role, but I still can't relate to Thomas (who has next to no personality, considering he spends half of the book sleeping or knocked out), I can't stand Teresa (she's all over the place!) and the other more minor characters all kind of blend together - we don't even know all of the Gladers' names, even though by the end, there's only 11 of them. I did like the introduction of Brenda, even though she freaked me out a couple times, but I didn't care for the love-triangle (kind of) thing that was happening between her, Thomas and Teresa. Overall I feel pretty meh about this, and will only read The Death Cure to find out why they were put through all of this in the first place. This was a brilliant sequel to the amazing Maze Runner. This books is set outside the maze where the stakes are even higher. This book was just as good as the Maze Runner, maybe even better. WIth a great plot and stunning characters, this The Scorch Trials is a book that is so worth reading. The Scorch Trials takes place straight after Maze Runner. The Gladers had escaped from WICKED and taken away by a group against WICKED. Outside the Maze, the world is dying. The government has disappeared, and now Cranks, people infected by a disease known as the flare, are roaming the crumbling cities in search of their next meal. The Gladers think that the Variables are over and they can leave, but they are faced with another task: They must cross the Scorch, the burned-out section of the world, and at the other side is a safe heaven which they must reach in two weeks. But the odds are stacked against and they can only wonder if they will ever survive. In the Scorch Trials, you get to know some of the characters that were the whole time but not mentioned that much. Some of the personalities change as people take sides and reality dawns upon them. The plot is just as good, maybe even better. I loved this book, especially the creep factor. If you love creepy, futuristic worlds inside a book, then this is so for you. Excellent Follow-Up to The Maze Runner! This was an excellent follow-up to The Maze Runner by James Dashner. The first book captivated me so much, I couldn't put it down and the second one did not disappoint. I read this book in the same way: barely able to put it down, thinking about it when I wasn't reading it, agonizing over it afterwards. It's true, everything is different in this book and there is an entire new cast of characters to get to know, but James Dashner makes sure we get to know the important ones and the others, unfortunately, are cast aside. So it must be in times like this. Although the boys are not in the Glade any longer, they are in a new kind of hell, but it seems like they're actually in the real world now. That's what makes this book so interesting: after the Glade, do the boys really need to stick together now? Should they? It's a great experiment to see how they relate to one another now that they're out of the bubble, so to speak. 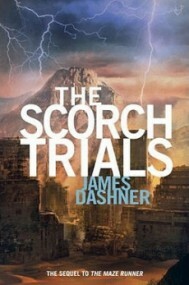 Another great think about The Scorch Trials is James Dashner's ability to bring on the creep. And by that, I mean everything is creepy from the beginning of the book until the end. I'm not sure if this is reality or if everyone is living in some kind of matrix. Although we're given more clues about the overall arc of the story, I'm still pretty clueless as to what's going on. Just like Thomas, I'm not sure who to trust and the people I thought I could trust, I've realized I can't. Or can I? The Scorch Trials is a great YA thriller and I'm beyond excited to get my hands on The Death Cure, the last in the trilogy that comes out this fall. I can't wait!